I spotted a tweet from Andrew Nacin this evening mentioning a new project from Alex King which has just gone live called Carringon Build. This project is huge news for WordPress developers, website owners and theme designers. 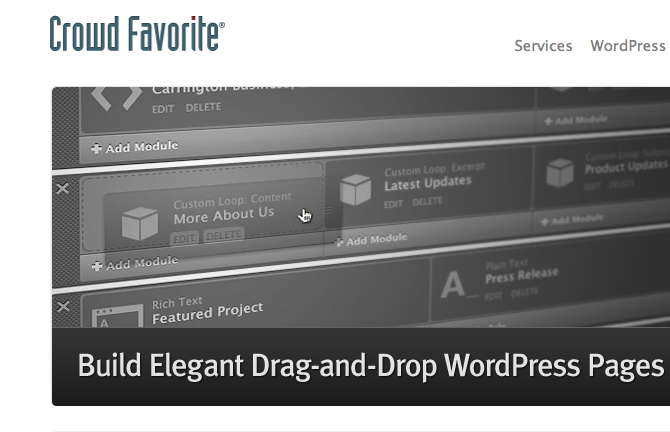 In a nutshell Carrington Build is a full featured drag and drop layout control system that hooks directly into WordPress. But describing it like that is like describing a Porche as being a fast car – it just doesn’t do it justice. This thing is definitely one of the more exciting WordPress innovations I’ve seen in recent times. My only concern at the moment is the whopping $499 price tag that it currently comes with. For the moment I think mass adoption of this feature will be limited due to the high price tag but I can see a ready made market for custom theme designers and wordpress developers doing consulting work on behalf of clients to build the cost of this plugin into their development costs. I’ve not looked to see if Alex is applying a GPL license to this plugin which I would think would be a good idea if Matt and Automattic are to help nurture this plugin. I would love nothing more to see this added to the WordPress core some day! Well done Alex to you and your team and the best of luck with Carrington Build. The $499 developer edition is for developers who want to integrate Build into a client project. The expectation is that the cost will be passed along to the client (and the client gets a great deal by geting all those features for less than 1 day of development at typical rates). As it isn’t just something you can drop into a site (it needs to be integrated with a theme), most people will want to purchase the Carrington Business theme for $149. I am hoping that other theme developers will soon be offering themes that include Carrington Build as well. thanks for stopping by to clarify pricing Alex. I must admit at first glance I didn’t realise Carrington Build was baked into Carrington Business! That’s a very sweet deal at $149. I will be looking at this very closely for my clients and I’m sure theme developers will jump on this. I don’t think they’d risk antagonising Matt by not releasing under GPL, but I can’t see the licence mentioned anywhere either. It’s one solution to the whole licensing mess, I suppose; don’t tell them they can get it for free until they’ve paid for it.